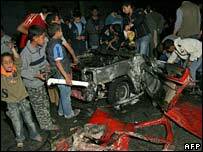 Five of the dead were in Jenin in the West Bank, where gunfire was reported to be continuing into the night. Also late on Saturday, an Israeli missile struck a car in the Gaza Strip, killing a suspected militant. The strike came shortly after rockets were fired from Gaza into southern Israel, slightly injuring two people. Three Palestinian militants, two from al-Aqsa Martyrs Brigades and one from Islamic Jihad, were killed when Israeli undercover troops opened fire on their car in Jenin. A Palestinian policeman was also shot and killed by Israeli troops near Jenin, Palestinian witnesses said. The man, Mohammed Abed, was watching an Israeli arrest operation in the village of Kafr Dan from a roof when he was shot, Palestinian security forces said. 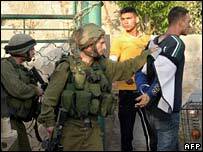 The Israeli army said its soldiers had been under attack during the operation and had fired on a man armed with a rifle. Hours later, Israeli troops returned to the Jenin refugee camp, provoking a gun battle with local militants, Reuters news agency reported. Palestinian officials said a 17-year-old Palestinian girl had been shot dead by Israeli troops as she stood at a window in her house. The Israeli army said it had launched an investigation into the shooting of the girl. The Gaza Strip also saw violence as Palestinian militants fired three rockets at the southern Israeli town of Sderot, one of them hitting a house. The militants said the attack was in revenge for Palestinian deaths in the West Bank. Two people were taken to hospital with light wounds, Israeli medical sources told AFP news agency. Four other people were treated for shock at the site. Minutes later, an Israel missile struck a car north of Jabaliya in the Gaza Strip, killing one man said to be a member of Islamic Jihad and injuring another, Palestinian officials said. The Israeli army said that it had attacked "the rocket-launching cell". A spokeswoman for Israeli Prime Minister, Ehud Olmert, told AFP that "Israel expects the Palestinian leadership to entirely stop rocket fire from the Gaza Strip." The Israeli missile strike brought swift condemnation from Palestinian Prime Minister Ismail Haniya of Hamas. "We call on the Arab leaders to urgently intervene in order to break the Israeli siege on the Palestinian government and answer the Israeli aggressions against our people," he said in a statement. Israel and Palestinian militants have observed a truce since November, although Israel has launched some raids, and militants in Gaza have fired some rockets into Israel. The Israeli army says the ceasefire still holds but Israel believes it still has the right to take defensive measures against rocket attacks. Islamic Jihad say they will not adhere to the truce while Israel continues to carry out raids in the West Bank.